Posted in: Articles, Posts by Author, Tom Carroll. Here’s a story about The Fourth of July and a fireworks display from a perspective most people never have a chance to experience. A Pyro’s perspective – the close-up view. Lakeview is forgettable, most people would say. A small town in Southern Oregon, Lakeview is isolated from the rest of the world by miles of lonely, two-lane highway and an ocean of sagebrush. Prospects seemed to change in 1955, the year Uranium was discovered nearby. Mining operations brought jobs and new residents. When the mine closed, people moved away, and Lakeview became forgettable again, by all but a few. I can never forget Lakeview. As a very young child, it was there that my imagination was ignited by fire on Independence Day. No different than other small towns – like most of America in the 50’s – on the Fourth of July, Lakeview area residents came together for a picnic in the town park. After dark, cars load of with moms, dads, and the kids, packed into the local drive-in theater. With metal speaker boxes hanging from the car window, a couple of movies scrolled by while everyone waited for the main event – the fireworks show. I was no more than four years old when following the films, I witnessed a column of purple fire rising into the night – a single hot burning comet attached to an aerial shell. These were words I did not know but would learn years later. The comets fire traced the path of the shell until the final moment – exploding with such beauty that this memory continues to burn the retina of my mind’s eye. Many years later, I ran a display fireworks business. When asked, I’ve always said that it was because of that purple comet. Fireworks shows are shot year-round for a variety of occasions. Still, for those in the business, it’s all about the fourth. One day that makes it all profitable – or not. One long, very stressful day that doesn’t end with a grand finale, doesn’t end until all the equipment and gear is packed up and everyone arrives home safely. Still, along the way, there are moments that made the work and stress worthwhile. On The 4th, I sent out crews of highly trained professionals, each loaded with all the fireworks and shooting gear needed to put on a show for towns around the area. It’s a wonder we never killed anyone. Yes, we were trained and had years of experience. But at heart, we were a bunch of overgrown kids, thrilled by all those fuses we’d soon lite – all the smoke, flame and concussion of shells lifting explosively from their mortars. It’s one of those experiences that defy explanation – a great big rush And you got paid to do it – usually. Once a year we did it for free. And gawd was it fun! Early on the morning of the Forth, drivers converged from towns all around the area. After checking all the state and federal paperwork – being sure each lead pyro had a clipboard full, case after case of shells were transferred to a fleet of trucks and pickup beds. Each truck displayed bright orange placards front back and sides – announcing that you were hauling 1.3G Explosives. Considering the time of year, and the day, those signs screamed, “FIREWORKS ON BOARD!” While on the road, the greatest danger our crews faced was other drivers staring at the signs – causing them to steer whatever they were driving right at us. Nice try, but not gonna happen. After all the other crews were papered, packed and on the road, the storage bunker still sheltered forty, or twice that many cases of shells destined for Wallowa Lake or La Grande – sometimes both. As we often shot back to back – two shows, two nights in a row. Both with equal enthusiasm. With no shame, I reserved these larger shows for myself and a group of friends. Members of this crew came from across the state. We had gathered for this single purpose for twenty years. Yes, we were friends, but we all knew it was about the powder. We were there to shoot shells! These were the “free” ones. Throwing profit, and more in with the community fund – the result was a whopper show, far out-sizing any small towns budget. Civic organizers never understood. No matter, this was a worship offering – an attempt to satisfy the Deities. Well… maybe just our pyro lust. Never fully satisfied, we always wanted more! Wallowa Lake is just outside of Joseph, Oregon. Glacier-carved, a lake surrounded by mountains, still snow-capped in July. Acting as a mirror – all that water again, a huge reflection pond, doubled the colorful effects displayed in the air. The setting could not have been more dramatic. Heavy floating platforms roped together, gave us three thousand square feet of deck space. The lake, three-quarters of a mile wide at its northern end, provided the required safe distance from the crowd. These numbers exceeded specified requirements, giving us clearance for the largest shells on the market, measuring sixteen inches in diameter. Forgive the cliché, but if ever it was true – where fireworks are concerned, size matters. Sadly, Oregon’s fire prevention authorities had pledged that we would never enjoy the ultimate thrill. True to bureaucratic small-mindedness – without regard for statutes or their own rules, year after year, our permits were limited to twelve-inch shells. They just never got it. And as concerns the big one – neither did we. Forget the sixteens, and no one makes a fourteen. Still, a twelve-inch shell is nothing to sniff at. Particularly, the right ones, made by gifted Taiwanese craftsmen. Hard-breaking beauties, each a masterful composition full of high color saturation stars. And when called for, the longest duration glitter tails I’ve ever seen. Perfect over water. After arriving at the lake and transferring all the equipment to the barge, we worked through the morning and afternoon, positioning, and securing the equipment. Racks holding hundreds of mortars – the tubes that contain the lift blast and direct the flight of the shells – all had to be braced and screwed to the decking. Nothing can be allowed to move when the show starts, and shells begin to fly. With the equipment in place, shells were lowered individually into pipes of matching diameter. Depending on its location in a bank of racks, an individual shell might need a longer fuse. After adding extensions, these lengths of fast burning fuse, (quick-match), are draped and taped safely around the mouths of the other mortars, bringing each end to the front where it is securing taped to the lip of the rack. A fuse running over the mouth of a mortar can result in a shell being jerked prematurely from its tube. Given the speed that everything is happening, in the middle of a show, a loose shell’s lift-charge is going to ignite at your feet. With nothing to contain the charge – comparatively little pressure – this is a usually not a big problem. Then again – it could ignite fuses hanging nearby, ruining a particular sequence. If luck is with you, this does not happen. When the shell itself ignites, there’s the same chance that other fuses will ignite. This loose shells, three to four-second time fuse already half burned as the shell rolls on the deck. Time left is best spent turning to look in some other direction. Exciting! Painful, when shell components whack you in the rear end. Two rules can never be violated. The first being; Never expose any part of your body to the mouth of a loaded mortar – nothing that you are not prepared to live without. If everyone does what they’re supposed to do, “exciting,” is as bad as pyro ever suffers. A heads-up crew watches other crew members and takes sophomoric delight in busting each other – even when there’s no way to avoid the infraction. It’s irritating. It saves lives. In this way and others, by late afternoon I’d offended every crew member. It was part of the ritual – me telling and re-telling them things they already knew. My strategy was to repeat safety instructions until everyone was totally fed up – but highly aware and on point. Everyone executed their jobs flawlessly, and no one ever got hurt. 4 pm. If we were on schedule, three, four, five and six-inch racks full of loaded mortars ran the length of both sides, and down the middle of the barge. Shells and fusing secured – it was time to take a break to admire the set-up. It was time for an early dinner. Time to get back at me. Dinner provided time for everyone to tell their funniest, “Tom’s an Idiot,” story. They had plenty of material to work with. Now we’re a tribe re-gathered. Bonded by years of similar experiences, we grinned at each other with nervous anticipation. All of us riding a river of adrenaline in anticipation of the semi-controlled madness soon to erupt around us. The crowd, our audience had been building all day. Long before dark, the park had filled with thousands. Late-comers now lined the highway and rocky shore. Blankets, coolers, and kids filled every flat and almost flat spot for as far as we could see. This included the lawns of hill-side and waterfront homes. The concept of private property was ignored – trampled under-foot. And all with a remarkable minimum of in-civility. You made lots of new friends if you owned a house near that lake. 8 PM. Heavy ropes straining, a towboat eases us away from shore, beginning the slow trip to where we lowered anchors into that beautiful lake, as the days last light fades. Still, there are two hours to wait. Waiting for full dark to descend. We put the time to good use. With our barge positioned and secure, we burn the time, re-checking every fuse and brace. This main barge holds muti-shot, tube clusters angled out over the water and the body of the show – shells up to six inches in diameter. We hand-lite everything with railroad fuzees. It’s safer to do it all with electric, now computer-controlled systems, but not nearly as fun. But we were there for the rush – a proximity thrill. Meaning that, more than approximately, shooters stood next to the action. When you hand-fire a show, you’re standing in a shower of sparks and burning debris – nose to nose with towers of flame. Over and over, the body absorbs the shock, as lift powder ignites, accelerating each heavy cylinder to a couple’ hundred miles an hour in fractions of a second. Did I already tell you it was a rush? Yung Feng shells – made by those Taiwan guys, these deserved particular attention, and that’s what we gave them. During the show, a deep, low-throated note signaled that one of these shells has lifted. This is a moment for the crew to stop everything and watch. In silence, eyes followed the orange glow of an ignition fuse tumbling, end over, as a shell rises to altitude. What happened next varied according to the specifics of the shell in the air. But it was always great – particularly if it was a Nishiki Kamuro. These were the ones we remembered and talked about later – and the year after that. I’ll explain a little more about them later. The largest shells and a complement of all the other sizes were secured on a smaller floating deck, an eight by ten-foot platform dense-packed with mortar racks and stand-alone, steel guns – holdovers mortars from the bad old days when we shot everything from back-breaking, steel pipe. Over the course of twenty years, we got smart and fabricated lightweight paper – then, high-density, polyethylene mortars. But for anything with a diameter of eight or more inches, steel was still the material of choice. Even this small barge was an impressive sight anyone who knew what they were seeing. With ropes attached, each heavy shell had been lifted to the lip of its temporary mortar home, and gently lowered into place before attaching the electric matches and insulated wiring that connected each shell to a radio-controlled firing panel. Comets fans and more muti-tube, finale boxes ringed racks of four and six-inch mortars – an assemblage of pyro pave’, linked to radio transmitter/receiver – each shot, just a button push away. Initially tethered beside the main barge for loading, now the finale deck is towed farther out and secured to the lake bottom with cement anchors and couple hundred feet of rope. One of a thousand details – it was imperative that this platform could not twist with wind and waves. Cold air flowing from high mountain ridges usually calmed by our ten pm – our scheduled shoot time. But outflow from the lake created a slight but steady current. Placing anchors on the “high” side of the drift and waiting for the ropes to pull tight – we dropped a third anchor off the other end, pulled in most of the slack – most, not all. On the calmest of nights, small waves caused the platform to sway gently. Anchor ropes pulled too tight could pull one end or the other underwater. Even with a sheriff’s patrol boat standing watch, one or two spectators watching from their boats could be counted on to dash us to get a last daring look at the “works.” More wave action – more strain on the anchors. One more chance that the small barge could drift out of line, leaving me blind to the control lights. Not fatal – but an additional stressor that I didn’t need. Propelling a heavy shell to altitude requires a lot of black powder, creates a tremendous recoil. Tens and twelves were positioned as close to the middle as possible to prevent flipping the whole deck. More than once we watched as lift energy shoved the small barge completely underwater, leaving us staring helplessly – wondering if the electrical system would live to ignite the next shell. Amazingly, it always did. By this time, all was secure as we could make it. Short of some unavoidable, but now, improbable event, the lights on the firing panel will be visible from anywhere I might stand on the deck of the main barge. Now I was ready to insert the key on the receiver side of the radio-controlled firing panel. Panic! “Where are the Keys?” Somewhere among my many pockets. Pants, vest, cover-alls? Before leaving the house early in the morning, I carefully pocketed all the keys – even spares for the trucks. Right now, I needed one of two special keys – the one that armed the receiver out here on the finale barge. Where did I? What did I do with that key? Not a year went by that I did not experience a few moments of terror. Precious little keys among a mountain of gear. Each year at this critical time in the day – here I am again, wondering if I had dropped them somewhere between home and the middle of the lake? Madly searching – never for more than a few moments – but an agony. And there they were, safely inside a zipped pocket next to my pounding heart. Inserting the key, I hold my breath and twist it to the first position, watching anxiously as one after the other, firing circuit lights blinks on. A failed indicator light would mean that a fragile wire or connector had been broken or pulled loose – easy to do when so much has been packed into a small space. Tracing the wiring would take time. Once again, I need not have worried – everyone had done their job well. All the firing lights are on. With a final twist, and the key locks into place. The receiver’s, Ready Light, a green LED begins to flash. Breathing again, I relax as Karl unties the mooring line and casts off. The short trip back to the barge is one of the days bench-mark moments to savor. All the parts and all our people were ready and willing. We were about to pull it off again. Nine pm. With float jackets squeezed under our coveralls and a fast-little boat manned and ready to pull anyone to safety, we were ready. Both ends of the barge were always left open, these being our escape route, and access to the fire extinguisher – that lake full of cold water. Some bled off nervous energy walking up and down the rows of racks, looking for imperfections. Some stood quietly, looking at all the lights, indications of the activity on the shoreline – thousands of spectators equally anxious for the show to begin. All of us were repeatedly flicking glances at watches, willing the minutes to tick by. Ten pm. With that one last look at my watch – the show begins. Rushes and single shells. Another rush followed by flights of two and three. Working our way up and down the rows of mortars – fast burning fuses flashing – shells lifting – surrounded by a fiery hot rain, concussion and dazzling light. Time means little with so much adrenaline surging through the body. We are transported. We are fire dancers in Carhartt’s and heavy boots – a ballet for daemons. As the last flights of shells lifted from the main barge, it was time for the finale. Reaching for the transmitter, I prayed, once again that it’s key – the second of two – hadn’t fallen out or the transmitter in the middle of all the mayhem. Thankfully, it’s there. Twisting this key to final arming position, a finger poised above firing switches… But wait! We need to revisit the whole sixteen-inch shell thing. Those really big shells – the ones that got away? We doubled our finale shots, beginning with two eight-inch Kamuro’s. 8 + 8, there’s our 16! Following these, came the last of our ten-inch shells – a single Yung Feng Chrysanthemum, gigantic ruby-red flower. Bureaucrats – you can’t fire them, but you can screw’m with the math. 12 + 12 = 24! Surrounded by flights of four, six and eight-inch shells, stood two large diameter mortars, each holding Nishiki Kamuro’s. Both Twelve inch. Add pre-fused, finale boxes and a-hundred salutes – a very respectable finale shot. With a successive push of buttons, their away. First, the eights framed by multi-tubed, finale boxes. Next, the Ten preceded by flights of smaller shells. And with a flick of a switch, the twelves lifted with a roar. Beginning a long ascent – they gracefully arched away from each other before a perfect, simultaneous break. When shells of this size perform at altitude, time goes side-ways again, as burning glitter stars spread to some eminence diameter in apparent slow-motion, the effect caused by the altitude – the unusual height of the shell break. There’s one last button to press, causing salutes to rise and hammer the sky somewhere near the mid-point of Kamuro sparkling glitter. Yung Fang Kamuro’s are special. Their primary components being huge, long duration, glitter comets. After the initial break, they develop into spherical perfection – the canopy. No gaps, no ragged, deformed edges before beginning an equally, slow motion decent. The glitter composition, microscopically porous charcoal infused with chemical mysteries, continues to burn – near weightless, particles hang in the sky motionless to the eye, as the comet bodies descend, an umbrella now, still perfectly uniform – hundreds of feet in diameter – glittering, drifting to earth. Each thick, fiery tendril still vibrant and full, from top to bottom. As this performance ends, a single, remaining ring of stars winks out simultaneously, only to reappear – a red flash a few feet above the surface of the lake. Two gigantic shells accompanied the salutes – heavy concussions. Just before the last, mesmerizing moments of Kamuro glitter, and It’s over. Embers, smoldering bits of paper littered the deck as hot mortars continue to smoke. Occasionally, a shell, having failed to fire but still hot, will lift with no warning. Nobody wanted to be near when that happened so we’d all sit somewhere out of the way, mixing the last of the adrenaline sloshing through our systems with cold drinks and cigarettes – whether you were a smoker or not. Nothing could have felt more satisfying. The towboat guy took his time, slowly guiding the barge to shore as we floated our way back down from pyro heaven. Nobody stayed up there – no one was hurt. Ever. That’s the perfect part. His dad and I smiled – thinking of his boy and remembering our own, “Wow” moments. Recalling a particular purple comet – I’m pretty sure I know exactly how that kid felt. 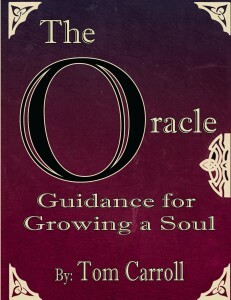 Posted in: Articles, Posts by Author, Spirituality, Tom Carroll, Uncategorized. The postman left a box yesterday but I was napping on the couch and didn’t hear the screen door open or close. So it was not until this morning when I gathered the nerve to brave the morning chill and ran to the car for a book that I had left, that I noticed the delivery – a package sitting on the porch. Passing it on the way out the door… mentally, I ran through the possibilities. I was not expecting anything ‑ nothing ordered. Nothing left in Sandpoint that had to been mailed down. Then it came to me. It was the week after Thanksgiving ‑ There was a fruitcake waiting on my porch! Snatching it up on my pass back through the door I used a knife to slice away tape, freeing the box flaps and foam packing. And there it was, protected and perfect with a card on top.